You only have one available wall to install your rectangular shade sail on your patio? Espace Ombrage makes available an adapted kit to answer your needs. It will allow you to benefit from a great flexibility with 2 wall fixtures and 2 adjustable poles. It contains 2 mural fixtures and 2 adjustable poles. Wall baseplates (threaded rod and bolts not included). The pole contains a slide mounted on tracks to adjust the sail height and incline. 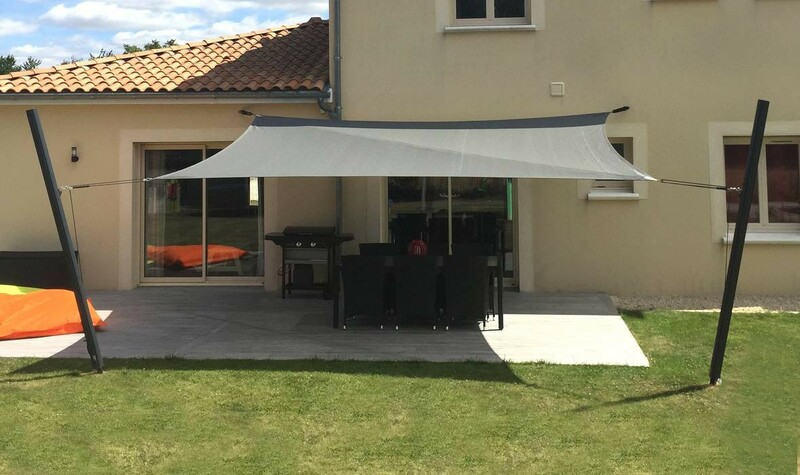 You can adjust the sail height to the sun throughout the day..
Removable: remove it easily during the winter and slide it into its base when the sunny days are back! The pole is removable in the sealed and screwed version. 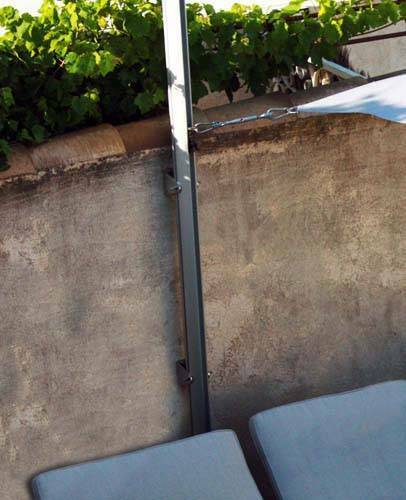 The given rope length allows an up to 2m50 space between the pole and the shade sail. Short wall fixtures: they are composed of a stainless steel tightener. 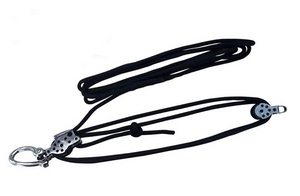 The tightener is 35cm in “open” position and 25cm in “closed” position, the tightener tension capacity is thus 10cm. Long wall fixtures*: they are composed of a nautical rope and stainless steel pulleys and allow a large amplitude in the installation. The distance between the wall anchor point and the sail can vary from 35cm to 2m50. If your need to separate the sail from your wall or to tighten a large sail, opt for this version. *The long reinforced wall fixtures (For Australe 340 and Acryl 300) contain double pulleys that facilitate the sail tension and render the installation more resistant as well as a twist shackle. 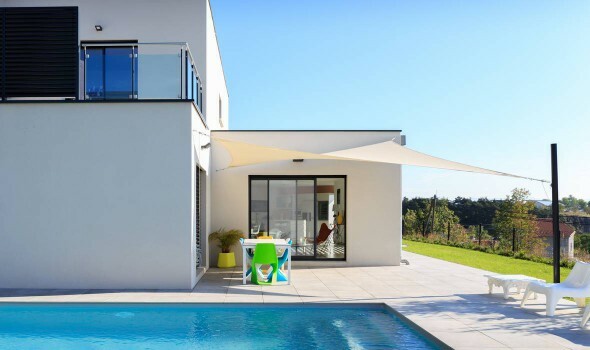 For the short wall fixtures: plan a tension margin of 30 to 35 cm in the continuation of the shade sail diagonals. For the long wall fixtures: plan a 40 cm minimum margin (and up to 2m50). 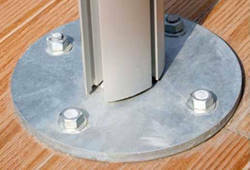 The piercing diameter for a concrete wall should be 14 mm and a 70 mm depth. 40cm minimum in the continuation of the shade sail diagonals, by taking the measures on the ground (if the pole is inclined, the tension margin should be of 40cm minimum at the base of the pole). 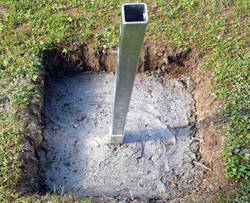 Create a 60cm deep and 40cm wide concrete slab in which the sheath will be sealed. The bigger the slab, the more stable the pole. 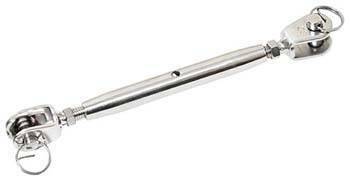 Insert the 1m20 steel tube in the sheath. 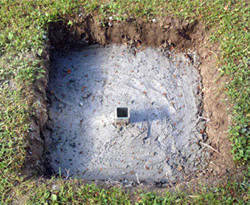 Tip : opt for fast drying concrete for an easier application. Plan 4 bolts and 4 threaded rods of 12mm diameter and 150 to 200mm length to fix the base. Pierce with a 14 concrete drill and make a chemical seal. Slide the pole on the base. Plan 12 bolts and 12 threaded rods of 8mm diameter and 100mm length to fix the 3 plates (4 anchor points per plate). Ensure a minimum space of 70cm between the 2 farthest plates.